It’s all about the remote. Bundled with the HD Pro is what must be the smallest remote control I’ve ever seen with more than a couple of buttons. And it certainly has more than a couple – the 4 square inch surface area is packed with an amazing 25 keys in a roughly 3 by 9 grid. The pint-sized clicker is the same proportions as a traditional remote, making it all the cuter just sitting on a table with “regular” ones. It measures 3.55” long, 1.18” wide and 0.83” thick (9.0cm by 3.0cm by 2.1cm), and takes two AAA batteries (included). 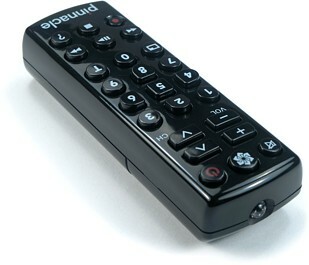 The HD Pro’s remote has hard plastic buttons, with a sort of soft springy feel to them. There’s very little real tactile response to speak of; the buttons go down and stop a little bit above the surface of the remote, with only the mildest “click” sensation. At the top are [Mute], [TVCenter Start Page] and [Power] keys, followed by a pair of [Volume] and [Channel] toggles. Below this is a 10-digit numeric keypad, with [Maximize] and [Teletext] buttons flanking either side of . The middle buttons in the keypad – , , ,  – are shaped like a 4-way directionally cursor pad, with [Select] on , although there are no other labels to this effect. Finishing at the bottom is a 5-way transport cluster with combined [Play/Pause] and dedicated [Record] buttons, plus an [Info] key. 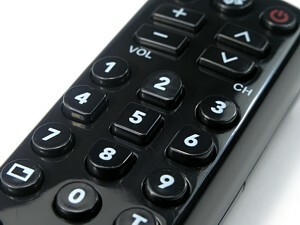 Pinnacle TVCenter Pro can be launched at any time by pressing the remote’s [Start] or [Power] buttons. While in the application the [Start] button brings up the right-click menu, which can then be navigated using the directionally-shaped number keys. This menu provides access to some functions not normally available from the remote. The [Power] key will shut down TVCenter Pro, but does nothing to your PC. Similarly, the remote’s [Volume] and [Mute] keys only adjust the relative volume in the TV application – they don’t touch the system volume control. The [Fast Forward] and [Rewind] keys actually behave like [Skip] keys, and jump ahead or behind a configurable number of seconds for each push. My kingdom for a decimal! While the size of the remote would allow for some limits on its functionality, there are a few areas where improvements could have been made. First, the [Teletext] key. In North America there is no Teletext feature, so the button does absolutely nothing. Second, the dash or decimal key. Or should I say the lack of such a key – it’s impossible to enter HDTV channels such as “29.1” directly by remote. As this is an HDTV tuner first, omitting such a function seems inexcusable, especially with that useless [Teletext[ button sitting right there. There is a way to access HDTV channels other than stepping through the entire list: press the [Start] button to bring up the right-click menu, hit  to highlight “Channel List”, press , then move up or down the list of channels with  and , finally pressing  to tune the channel. As Pinnacle documents, the remote control is not compatible with MCE specifications, and will only function with their software. Enterprising third parties may be able to untie the remote and make it operate with the likes of Girder or Intelliremote, but going to that amount of trouble isn’t something that average users will want to do.